This classic study offers a history of anti-Japanese prejudice in California, extending from the late nineteenth century to 1924, when an immigration act excluded Japanese from entering the United States. 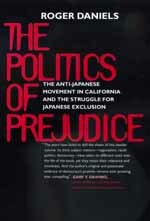 The Politics of Prejudice details the political climate that helped to set the stage for the incarceration of Japanese Americans during World War II and reveals the racism present among middle-class American progressives, labor leaders, and other presumably liberal groups. Roger Daniels is Charles Phelps Taft Professor of History at the University of Cincinnati. His many works include Asian America: Chinese and Japanese in the United States since 1850 (1990), Prisoners without Trial: Japanese Americans in World War II (1993), and Not Like Us: Immigrants and Minorities in America, 1890-1924 (1997).